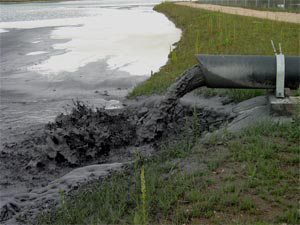 To understand what pulverised fuel ash (PFA) also known as fly ash, is and how it it is produced, one needs to needs to know a little about the coal burning process. Didcot Power Station has four Babcock front-wall-fired boilers. Coal fed to the boilers is first pulverised into a fine dust, mixed with air and blown into the furnace where it ignites and burns at temperatures in the range 1100 and 1700 degrees Celsius. The process is a continuous one, more like a gas boiler than a domestic solid fuel boiler in operation. However, unlike gas, coal burning is very messy. Profuse amounts of fine ash are produced, some of which, including the coarser element, is deposited on the floor of the boiler as FBA. The remaining PFA is carried out in the waste gas stream from where it is removed by filters. PFA is a fine grey powder with a bulk density of 1.2 – 1.7 g/cc. It consists of a glassy material whose principal constituents are silica, alumina, iron and calcium. 2%-5% is soluble in water. Particles are generally rounded and in the 10 micron range. The source of these figures does not state the type(s) of coal being burnt. The actual composition of PFA, particularly with regard to lower-level contamination not mentioned in the above list, depends on the type and origin of the coal. In recent times, Didcot coal has been sourced from the world-wide market and its composition is therefore likely to be highly variable. Detailed analyses of Didcot PFA are currently not available. The specification of the coal requires an ash content in the range 10 – 35%, and 20% is generally considered to be a good working figure. However depending on the quality of the coal being burnt, the amount of ash produced can vary by factors of 2 or more. This is one way the power station operators are able to control ash production. In 2002, the rate of cenosphere harvesting from Radley’s lakes was about 400 tonnes per year. A contaminant of PFA that has a bearing on its value is unburnt carbonaceous material, referred to as “loss on ignition” (LOI). This accounts for the grey/black colour of the ash and renders it less acceptable for some applications where colour is important. The LOI content also adversely affects the strength of concrete containing PFA. The LOI content of Didcot ash has risen in recent years, due to enforcement of lower (less efficient) combustion temperatures to reduce NOx emissions. On the other hand, unburnt carbon removal is now possible using new ash benefication technology recently installed at the power station. This cleans the ash and renders it more acceptable to the market and should allow the power station to increase its level of PFA recycling beyond current levels. Unfortunately the single plant has the capacity to process at most only 125,000 tonnes of ash per year. This, we fear, is a case of too little too late. Other methods for reducing NOx emissions without resorting to lower combustion temperatures are possible (eg catalytic converters) would involve greater levels of investment than the operators of Didcot power station are currently prepared to commit.